SCVO and its members believe that the EU has broadly been good for Scotland and Scotland’s third sector. We support measures to ensure that the many protections we currently enjoy are not jeopardised – read our full briefing on what Brexit is likely to mean for the third sector or take a look at our key messages. SCVO has a long and active history with the European Union and European civil society, working with out partners and networks across Europe on areas of mutual interest. 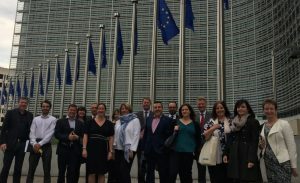 These include shaping and influencing policy, providing information and representing the interests of the sector in European Funding, encouraging and promoting participative democracy, sharing best practice from across Europe, collaborating on joint projects and providing up to date information and advice to our members and partners. A delegation of representatives from Scottish third sector organisations visited Brussels in May 2017 to engage with the institutions of the EU, to make the sector’s voice heard, let hosts know that Scotland’s third sector is overwhelmingly pro-European and making clear the frustration at the lack of space for civil society in the ongoing debate. Here at SCVO, we love charities. We believe every person who works to make a difference to Scottish communities should be valued, and that includes our colleagues who have come from other EU countries to live and work here. Scotland’s third sector is strengthened thanks to their contribution. Find out more about our #EUareValued campaign here. Click here for the latest reports, briefings and papers on topics relevant to Brexit and the third sector. Alternatively, join our mailing list for all the latest news. If you have contact with European networks and institutions, or collaborate with them on any issues, please help us build a more accurate picture of the networks and projects the Scottish third sector is involved in by completing our European Connections mapping survey. The Scottish Centre on European Relations is an independent and unaligned EU think tank, based in Edinburgh. Take a look at their website for their latest policy analysis, comment and events.